I woke myself up in the middle of the night. Talking. Well, it might have been only 10:30 or 11 p.m., but it felt like the middle of the night. Darkness lay over me. Thanks to a light blocking shade in my bedroom, when it’s night time I can’t see my hand in front of my face. It’s a fog of black and empty. Conducive to sleeping, but not so helpful during an adrenaline spike. And maybe that’s why I startled myself awake in the first place. Part of the zero (dreaming peacefully) to 60 (panic stricken confusion) awakening also may have resulted from the new room arrangement. I’m a re-arranger. Have been since my adolescent years. Two, three, maybe four times a year, I’ll be rearranging furniture somewhere. I’m hip to helping others rearrange their furniture as well. It gives new perspective. It also aids to confusion and terror when waking up and not knowing whose strange room you’ve been abducted to. But within a few seconds you realize it’s your room, your bed…and then you scoff at yourself for being an idiot. Clearly, in my dream. I was experiencing a home invasion. But in all likelihood, my 14-year-old son flushed the toilet and the sound of the water swirling into the sewer system of toney Maple Grove, Minn., startled me out of my slumber. An Aside: My Mom always told me not to eat before going to bed. Eating results in the digestive system going into gear and once those juices start flowing funky things happen to the brain – your dreams become wicked. Her sage advice didn’t work for me as a kid. I had plenty-o-dreams in which dinosaurs were trying to eat me, thus forcing me to spend the night at the foot of Mom and Dad’s bed with just a pillow and my Snoopy stuffed dog. Nothing protects like Snoopy. (But as a more rational adult, isn’t it true that a dinosaur would just see me at the foot of Mom and Dad’s bed, eat me and then devour them as well! Derrrrr!). To wrap this story up, last night I woke up yet again from a sound sleep. Convinced that my cell phone had somehow fallen under the bed. Naturally, I performed the most bravest of acts known to mankind. I leaned over the side of the bed. I slowly lifted up the bed skirt. And, precariously balancing on one hand in order to keep from falling out of bed, I looked into that cavernous dark space that only evil clowns or Chuckie dolls can reside. Nothing. Too dark. In order to see I needed a light, so I grabbed my cell phone and hit a button giving a faint blue familiar glow and started to look again only to realize that my freaking cell phone was right there in my freaking hand! It was 1:18 a.m. Why was I awake? Perhaps the trick is to not eat after Noon to avoid these wicked sleep-hindering awakenings. Remember the old Mac SE computer? Remember the constant disc swapping in order to simply launch a program like MS Word? After learning how to compute using a Mac in college back in the ’80s (yes, I am that old), I entered the business world and promptly shifted over to PC computing using the once known as IBM platform. I even labored for Gateway, where there was ready access to all the latest and greatest PCs as they were rolled out in the late ’90s. For the past 10 years, my employers issued to me the standard office Dell portable computer – a new one every 3.2 years (approximately). Hell, I even own a Dell Inspiron 6000 laptop as my home computer. I’m a guy who sticks to what he knows apparently. 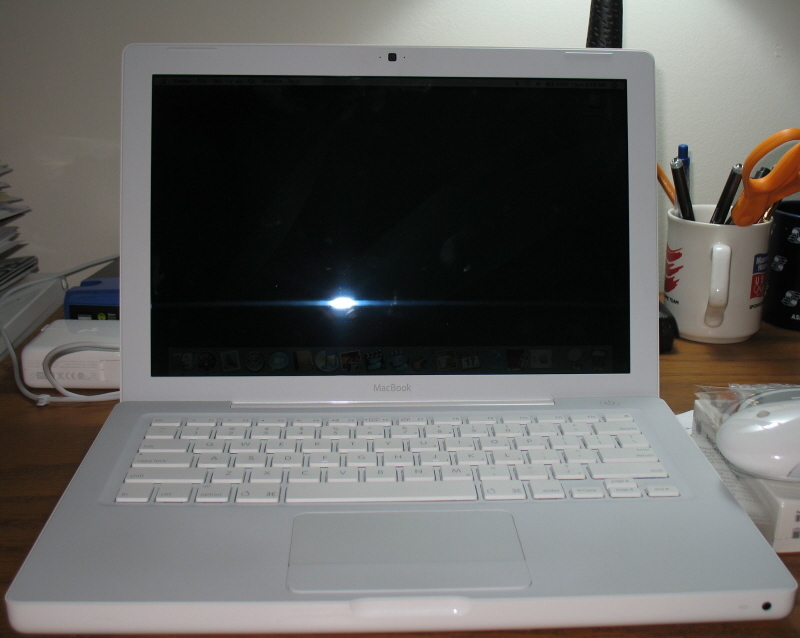 But, on July 26, I made a sojourn to St. Paul to purchase a Macbook. It’s the first Mac I’ve ever owned and it’s not even for me. It’s for my teenage daughter whose hand-me-down Gateway portable took a dump of largess proportions. Something with the power cord jack being connected to the motherboard and the repair costing twice what the computer could possibly be worth. So sitting on my desk (see photo) is a nice shiny white Apple-made computer direct from Cupertino, Calif., (or perhaps China) to replace that archaic Gateway. With luck, this computer will take my daughter through her college years. In fact I know a couple people who are still using Mac portables that are nearing the 10-year-old mark. I’m guessing there are far fewer disc swaps required to make this Macbook run smoothly. After picking up the new computer, my accomplice and I stopped at the Happy Gnome on Selby Avenue in St. Paul for some fine patio dining. Gnomes are bizarre fantasy creatures and why someone would name a bar/restaurant the Happy Gnome remains anyone’s gnuess. A more appropriate gname might be the “Creepy Gnome.” This particular establishment, though, features a cool menu of items along with some of the standard bar foods. Fortunately, the gnome decor is kept to a minimum. The bar at the Gnome, offers about a millionty-six different bottles of beer including the very tasty pale ale brewed in Wisconsin called Fatty Bombalatty. A few Fatties and appetizers later, the mosquitos arrived, chasing us off the patio and back to Minneapolis where gno mosquitos exist whatsoever. Macs. Fatties. Gnomes. Mosquitos. There seems to be a Lord of the Rings episode in here somewhere. Jessica Lange may no longer want to live there, but Stillwater, Minnesota has become quite the little town for attractions. A little more than a month ago, I was there managing media relations for the Nature Valley Grand Prix. Last night, I returned to Stillwater for the one, the only…Lumberjack Days. Story has it that past Lumberjack Day concerts, including one featuring Lynyrd Skynyrd, ended up with cars tipped over and many drunk and disorderly arrests by the Stillwater PD. Perhaps that’s why organizers now book bands like the yuppified BoDeans to headline the evening. I’m way past my car-tipping-over-seems-like-a-good-idea-because-I’ve-had-too-much-to-drink-days. So the BoDeans seemed just right on a beautiful July night in Stillwater. In this video, the band schleps its newest CD, “Still,” at a Best Buy store. What an awesome quote eh? It’s from Sherwood Anderson and was published in Sierra magazine. I’m not an avid cyclist. I enjoy it. It’s a hobby to me. In the course of a summer, which is short here in Minnesota, I may log 1,500 miles on my bikes. I know that’s a small number compared to the die hards – heck it’s small even compared to some casual riders I know. But I’m making no excuses. I like cycling. I like it most when the weather is good, the wind is minimal, there is no rain, it’s not to hot. Okay, I’ll admit it. I’m a fair-weather cyclist. There. I said it. So this weekend the tri club has one of its monthly century rides planned and I’m all in. It’s a supported ride and no one gets left behind (sounds awfully familiar). What’s more, the weather is suppose to be fair and mild on Saturday. My thinking is, without a lot of prep, I can join up and spend several hours logging the century without my legs seizing up and without killing myself trying to keep up with those younger guys (cough) setting the pace out front. My main form of preparation for the ride? Seeing the BoDeans in concert on Friday evening at Stillwater’s Lumberjack Days event. Beer tent anyone? I think I’ll refer to this as carbo-loading. And if Saturday morning comes to early following the activities of Friday night, that century ride can wait. See, I told you – fair weather. The happiness quotient is in play. At least for one-half of the former couple that was once married and shared a life. Divorce does strange things to relationships, especially when there’s a couple decades of history strewn over the trail. We survived 20 years of marriage, two children, and the count-the-slices-in-the-loaf-of-bread-so-we-can-ensure- we’ll-have-an-adequate-food- supply-until-our-next-payday days that served as the foundation to the beginning of the marriage. So my ex is on her road to happiness. The giddiness comes through the phone during our infrequent calls as well as through the conversations shared with our two children who bounce back and forth between homes – hers and mine. The new guy is moving to town. He’s taken a new job very close in proximity to where she works. And while all this makes me happy – happy for her, happy that her life is back in a semblance of order after a broken marriage created at my hand, I’m also a bit…on guard for some strange reason. In contemplating the protective shield that I feel going up, it seems to stem from the fact that there is someone on my home turf, experiencing time and moments with my two kids, spending the night in the home I bought and continue to remunerate even now. I feel a harsh, covetous edge from time to time along with a sense of relief. Very odd. What am I worried about? That I care? Both my children are old enough to know that I’m their Dad. Even through the worst, I’ve always been Dad – never absent, never the vanishing parent. I provide, I nurture, I mentor, I care, I love like I always have and always will. But that ground, I suppose, is uneven since the divorce. There’s been, and likely always will be, a drive to make sure my turf as parent can’t be taken. While they may mess it up, no one else is allowed on it. And as it becomes encroached in this very subtle way, how can I not put up the shield and dust off the “Beware of Dog,” sign? I’m happy the ex is happy. It’s one step closer to healing the devastation. But just as one page seems to turn, another unfolds and keeps the collateral damage assessment fresh in my mind. I caught this story on Google News today and just had to write about it here. While I’m not a huge fan of the Subway chain of sandwich shops, I have to admit, this kind of incident is one of those rare things that just happens. 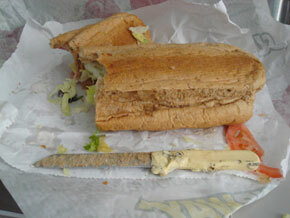 The gentleman that purchased the sub, complete with a deli knife baked INTO the bread, got lucky when he tasted his deli concoction. He’s already settled his case for $2,500 (I’d say Subway corporate got off easy with this settlement, wouldn’t you?). So the next time you belly up to the sub sandwich place of your choosing, you may want to ask the sandwich stylist (or whatever it is they call themselves today), “Say, what’s in your bun?” And then inspect that sandwich before chomping down on it.